Journalism is getting something of a battering in Australia. At the parliamentary level, laws have passed that would be inimical to any tradition versed in the bill of rights. (Australia, not having such a restraining instrument on political zeal, can only rely on the bumbling wisdom of its representatives.) At the executive level, deals have been brokered between Canberra and various regional states to ensure minimum coverage over the treatment of refugees and asylum seekers. Secrecy is all fashion. Adding to this is the triumph of a certain breed of lazy, compliant journalist. The image of the ragtag journo long lost in the speculative tripe of Evelyn Waugh’s Scoop has been replaced by a tedious, technocratic lout who should, time permitting, be put out to a distant pasture. We are now dealing with compromised dispatches, press releases that yoke the reasoning and analysis that would barely pass muster in the lower grades of a half-credible primary. The investigative journalist has, for the most part, disappeared, leaving a few brave scribblers to toil in the wilderness. The corporate angle on this is fairly unremitting: wedged between the Murdoch behemoth (populist, ragged Herald Sun, or the screaming ideological The Australian) and the Fairfax machine (given a progressive tag), the options for the enterprising press writers are narrow. From the perspective of covering the brutal refugee policy Australia insists on pursuing, the Murdoch press tends to earn the medals of the island authorities in Manus and Nauru. Fairfax shuffles along in the background with the occasional note of condemnation. The restrictions placed on covering the policy of the Australian government and those paid subsidiaries on Nauru and Manus remain on par with the secrecy protocols of the Cold War. Since its inception, the Australian policy towards boat arrivals ultimately sent to those isolated island reaches has smacked of colonial patronage, with the regulations to boot. Elevated to the levels of high secrecy under the term Operation Sovereign Borders, “operational details” in dealing with boat arrivals, as they are termed, have been a matter of clandestine value. The degrees of control have also extended to covering camp conditions, a matter policed by such brutish little laws such as the Australian Border Force Act 2015 (Cth). Under that bit of legislative nastiness, those who obtain “protected information” in the course of their employment in the border force apparatus can be punished for two years for disclosing such information except to authorised personnel. Prior to the passage of the ABFA, the Australian government made it its business to hound a number of Save the Children employees working in the Nauru Regional Processing centre. Their sin had been to disclose information on the lamentable conditions in the centre. The levels of media management regarding reporting on the conditions in Nauru has been extreme. Amnesty International has called this a veritable “wall of secrecy”, designed to conceal “a system of deliberate abuse”. The Nauru government has periodically limited access by journalists to the island, a process made craftier by the hefty visa application fee. In 2014, the non-refundable fee of $200 jumped to $8000. This decision had been occasioned by “this organisation’s blatant interference in Nauru’s domestic politics prior to the 2016 election, harassment of and lack of respect towards our President in Australia, false and defamatory allegations against members of our government, and continued biased and false reporting about our country.” Other outlets, such as the more palatable A Current Affair, The Australian and Sky News, have received no such accusations. The thin-skinned disposition of those authorities was not condemned by the then Turnbull government, a point unsurprising given the close media management being conducted between Australia and Nauru. What has since transpired is that suggestions by officials in Canberra that Australia’s role in the affair is minimal must be taken with a pinch of coarse salt. 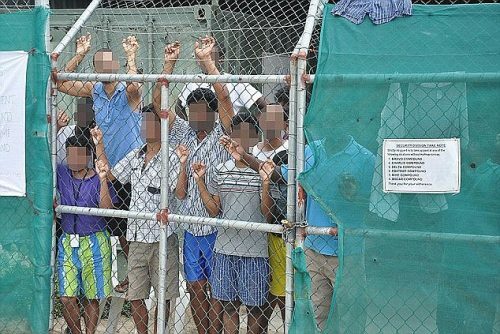 A document tendered to federal court as part of a Nauruan medical transfer case is enlightening. “The governments of Australia and Nauru,” it goes, “will agree to media and visitor access policy and conditions of entry, taking into consideration the requirements of section 13 of the Asylum Seekers (Regional Processing Centre) Act 2012.” Those “seeking access to a Centre will be required to obtain permission from the Secretary of Justice and to sign a media access agreement.” Nothing, it seems, must be left to chance in letting Australians know what is taking place in those outposts of torment and misery. Gee, I wish I could suggest something cheerful. The biggest defeat this week has of course been offshore as the world behemoth inexorably sloths toward totalitarianism by way of a loaded Supreme Court. A small clique of corrupt politicians running Nauru are utterly dependent on the roughly $600 million that Australia feeds into their economy ostensibly to fund the only viable industry on the island : refugee detention. Actually there is another industry on Nauru and it centres around corruptly funneling Australian aid into the pockets of this small clique of unprincipled politicians. They are desperate to hide from the world what is actually going on and their biggest fear is that Australia will empty the the camps and turn off the flow of aid hence the hostility towards the media who offer the best opportunity we have to shine a light on this travesty. Just today we hear that the Nauruan political thugs have banned MSF from the island, presumably to prevent details of the plight of children in detention getting out. Labor’s left faction is beginning to raise its voice about the plight of children on Nauru – concerns have been raised at a meeting of factional convenors and union bosses, and there has been a public expression of unease from the member for Batman, Ged Kearney. Will Ged Kearny, Kristina Keneally and Lisa Singh be strong enough to demand Labor finds its humanity? Another concern is the Coalition’s plan to outsource visa processing. In February Guardian Australia reported that departmental briefings to industry had revealed that a successful private bidder could offset the $1bn cost of a new visa processing system by raising revenue through “premium services for high-value applicants”, different access for those able to pay more, and “commercial value-added services”, such as offers from banks, telcos and tourist operators. Groups reportedly keen to bid include a joint venture between Accenture and Australia Post, and a consortium involving Pacific Blue Capital, Qantas Ventures, PwC and Ellerston Capital. Pacific Blue Capital is run by Malcolm Turnbull’s former employee and friend Scott Briggs. Yes, Kaye Lee. Anything goes these days. Oligarchic globalisation has stripped away most community defences and the bones are now ripe for picking. People are commodities and symbols in a game when employed by vested interests for consent manufacture, commodification and reification of people and ideas over generations and this is demonstrated most plainly in the form of the crass Nauru example. The Berejiklian NSW government’s souless prostituting of the Opera Gouse to peddle horse racing ads is emblematic. “The representation of material interests abolishes all natural and spiritual distinctions..enthroning in its stead the immoral irrational soulless abstraction of a particular material object and a particular consciousness that is slavishly subordinated to this object”. “National security” is a good excuse for the oligarchy to avoid compensating tens of millions of “others” uprooted by exploitation and war in pursuit of a fitful attempt to sate an addiction to power and greed via the peddling of diversionary mirrors, beads, and trinkets to us. Tough luck for THEM, eh? “The state is based on this contradiction… the contradiction between public and private life, between universal and particular interests. For this reason, the ( now globalised, bourgeois) state must confine itself to formal, negative activities”. Amazing how succinct Marx is, considering this is stuff and much more written a hundred and fifty years ago. ” The Berejiklian NSW government’s soulless prostituting of the Opera House to peddle horse racing ads is emblematic. Yes, paul walter, when the above is possible then anything goes; where’s our humanity,our compassion, our appreciation of beauty, we can’t call Oz a civilized country when even PM finds this OK…I wonder what Utzon will think and feel on finding out about this vulgarity…?What will happen to those sick and depressed asylum seeker children, what is their crime….? Its all got a bit very perverted, hasn’t it?